Documoto is a structured parts information and parts books creator and manager designed by Digabit. It makes the process easy and the maintenance effortless. These catalogs can even be printed, exported into PDF files, or published into interactive online indices. Documoto for digital parts catalogs is ideal for manufacturers of heavy paraphernalia and complicated parts who wish to keep relevant information in a structured and centralized database. This allows them to further optimize their operations and also to enhance their sales strategies, and service and technical support. With Documoto, manufacturers no longer have to struggle with updating their data and keeping up with the latest technologies in the industry. 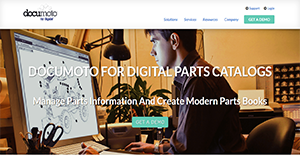 Documoto’s digital parts catalogs are designed in a way that users can easily create relationships between parts, machinery, and support materials so they can be easily found when needed. The catalogs can also be structured in a way that these relationships are effortlessly found for quick updates and service and technical support. With Documoto, manufacturers are able to painlessly create parts and machines catalogs on the cloud. They can also print their files, turn them into PDFs for sharing, and also upload them to their websites as interactive parts and machines catalogs. Moreover, companies can also ensure that information shared in their catalogs are up-to-date and in touch with the latest innovations in their respective industries. Furthermore, businesses can save time using this tool compared to the use of traditional publishing methods. Writing up information and formatting the data is made quicker so catalogs are done faster. Documoto automatically converts data and images into files that can be used for catalogs. This way, they can be used several times over in different files, whether print or digital, without the need for redundant manual conversion. Users can modify multiple catalogs with ease with Documoto. That is because the application supports simultaneous updating and saving so users can save time. This way, they only need to open one file, make the changes there, and cascade the edits to related paraphernalia. If you are interested in Documoto it may also be a good idea to investigate other subcategories of Best Digital Asset Management Software gathered in our base of SaaS software reviews. Organizations have different wants and requirements and no software platform can be perfect in such a scenario. It is pointless to try to find a perfect off-the-shelf software product that fulfills all your business wants. The smart thing to do would be to adapt the solution for your specific requirements, worker skill levels, finances, and other factors. For these reasons, do not hasten and subscribe to well-publicized trendy solutions. Though these may be widely used, they may not be the perfect fit for your specific requirements. Do your groundwork, check out each short-listed application in detail, read a few Documoto reviews, speak to the seller for explanations, and finally settle for the app that offers what you need. How Much Does Documoto Cost? Documoto’s SMB and enterprise pricing information is available only upon request. Contact the company for more details, and ask for your quote. We realize that when you make a decision to buy Document Creation Software it’s important not only to see how experts evaluate it in their reviews, but also to find out if the real people and companies that buy it are actually satisfied with the product. That’s why we’ve created our behavior-based Customer Satisfaction Algorithm™ that gathers customer reviews, comments and Documoto reviews across a wide range of social media sites. The data is then presented in an easy to digest form showing how many people had positive and negative experience with Documoto. With that information at hand you should be equipped to make an informed buying decision that you won’t regret. What are Documoto pricing details? What integrations are available for Documoto? If you need more information about Documoto or you simply have a question let us know what you need and we’ll forward your request directly to the vendor.